And just like that it’s 9:30. Happens so fast, this thing called time, one second we have plenty of it and the next it’s gone. 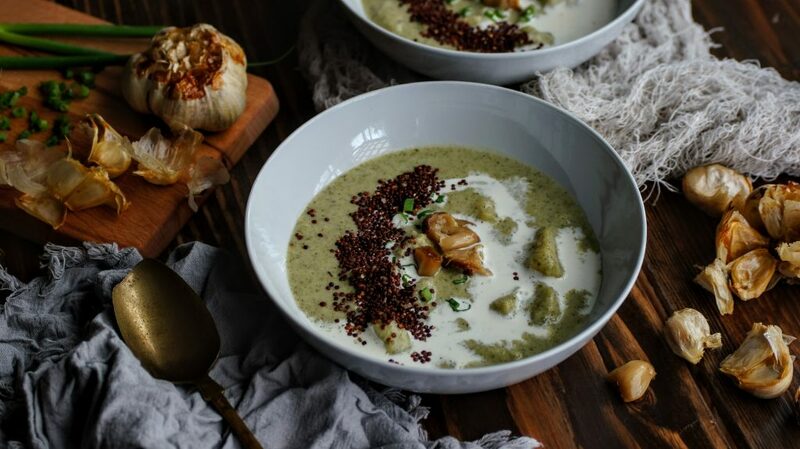 I find myself using every ounce of precious time each day, from the time I wake up to get the kids breakfast, ready for school and out the door until the last hour of the night whether I’m finishing cleaning, cooking, baking, PTA work or blogging. Sometimes I can’t find the pause button, it’s now or never, do or die, something is always happening. 7 years ago I made the choice to stay home to raise my kids, I think I only questioned leaving my job as a teacher for a few seconds. I remember being in one of my M.Ed. literacy classes and asked my professor, what would you do? She said, without question, you might regret going back to work too soon but you will never regret the time you spend with your kids. And so, my one year leave has become a 7 year leave of absence. I think about the old days, teaching in the classroom, working with amazing colleagues, inspiring young minds but then I stop and think that I have inspired young minds, my own little ones. And then I breathe a sigh of relief. I haven’t been doing nothing all these years, I have been molding the minds of my own children and it’s been worth it! So about this stay-at-home mom business. You know, frankly the first 5 years are a blur to me. I was home with 2 toddlers and a baby (then 3 toddlers), I can honestly say I powered through. Sure we had good times but I have blocked out the tantrums, the schlepping of kids to the bathroom when we’re out, the diaper blowouts, the tantrums (did I mention that already? ), naps and the days without naps. I remember the good fun times too but how I managed 3 kids is kind of astounding. There were days (many days) when I realized that managing thirty 4th graders was much easier than my days at home. It wasn’t all cupcakes and sunshine. It was work, hard work. I also think about those mamas that do go back to work and make their schedules work with their little munchkins. Sometimes that is the only choice and it’s a tough one. Balancing the stress of a job, trying to spend every ounce of energy left with your littles and manage the homelife. That is not an easy task to accomplish. I commend you wonderful, powerful ladies because for you it isn’t all cupcakes and sunshine either, it’s work, hard work. Every aspect of our lives is an obstacle, a challenge, something to help reach us to our next milestone. For me, the time has come where I am supporting my children but also enjoying the bit of freedom they have allowed me as they grow older. My time is dedicated to managing our home, cooking, taking care of the kiddos, working as our school PTA President, being a loyal friend, connecting with people new and old to maintain and build relationships, support my amazing husband as he does for me, help my parents with needs they have and whatever else life throws my way. People always comment to me telling me I’m Super Mom, nah, I’m just a mom and all our super powers are different. We all have our strengths and our weaknesses, none of us are Wonder Woman (no matter how bad we all want that!). I know that my powers come from my mom and dad, they are my rocks, they are the ones that taught me to persevere and tackle anything that comes my way. My next journey is here, it’s here with all of you! So, while I’m hard at work keeping up with all things life throws at us, I did manage to make this delicious soup. 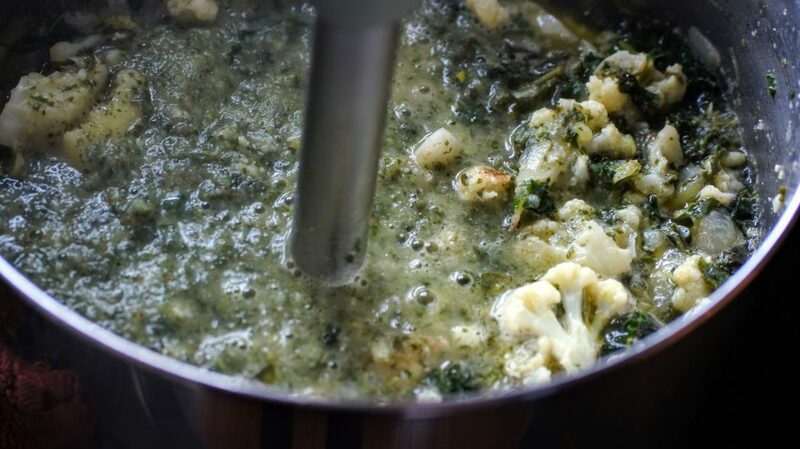 It’s packed with cauliflower and kale and my kids not only ate it but loved it! I hope you enjoy too! 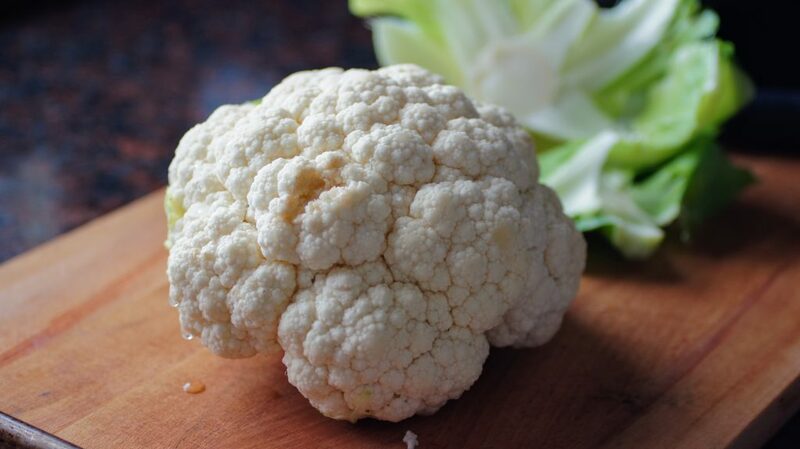 Begin by prepping your cauliflower, remove the stem and leaves and cut cauliflower into florets. Next clean and cut your potatoes into quarters, leave the skins on. 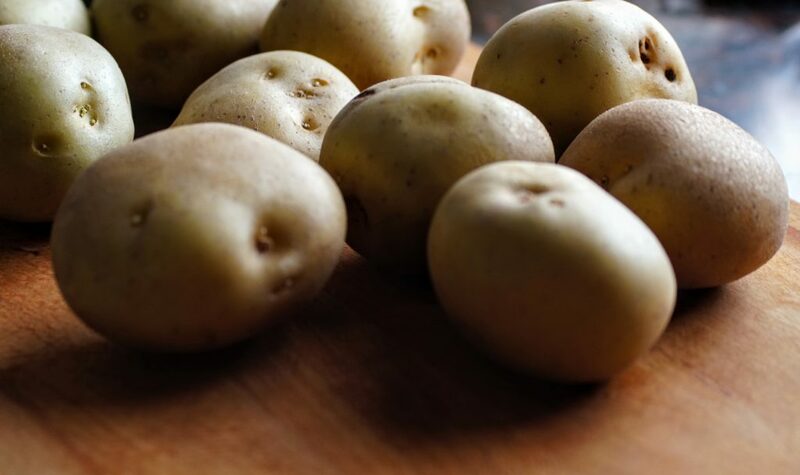 In a large pot, place potato quarters and fill with water on medium high head, allow to soften until fork tender, about 10-12 minutes. Drain and set potatoes aside. 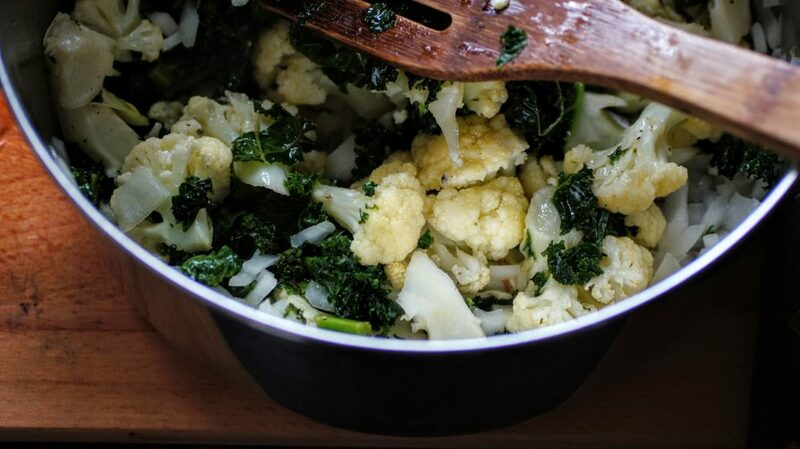 Add your olive oil to the pot on medium heat and add your chopped onion, cauliflower florets and kale. Sprinkle with a touch of kosher salt. Continue to stir and coat with the oil allowing the onions to become translucent and the cauliflower a bit browned. 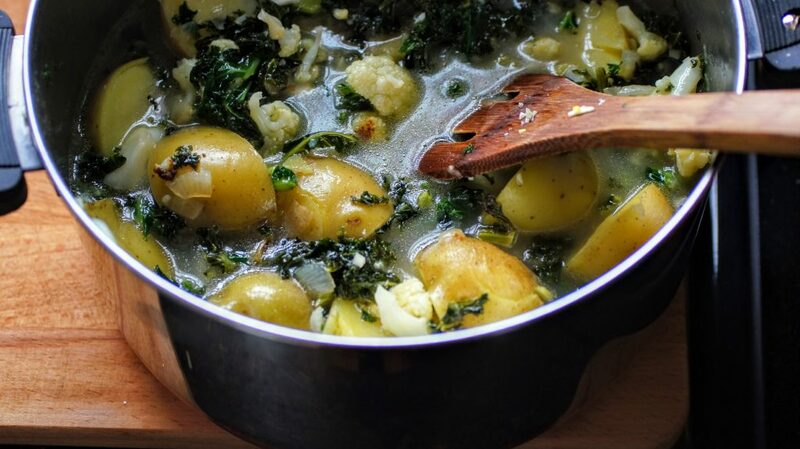 After about 10 minutes, add your garlic until just fragrant then add in 4 cups of your stock and half of your cooked potatoes with the peels. Allow all the vegetables to become tender. 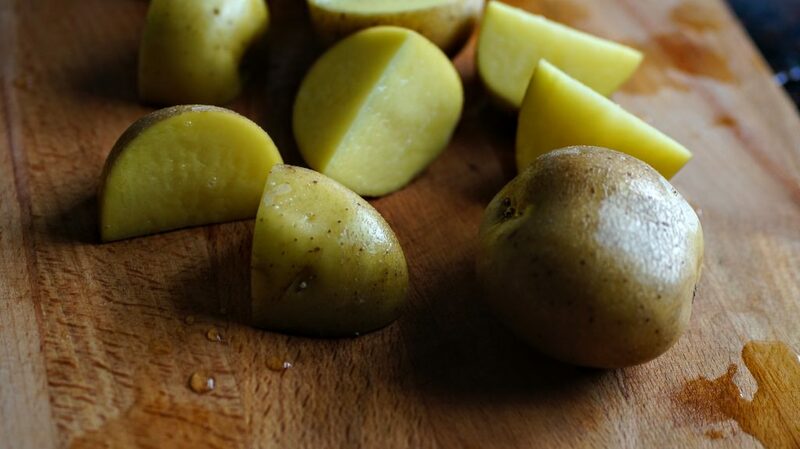 Peel and chop your remaining potatoes and add to the soup. Finally season with salt and pepper to taste. Top with cream and serve with bread or toppings below. See notes below about toppings on soup and adjustments for vegan/dairy free options. 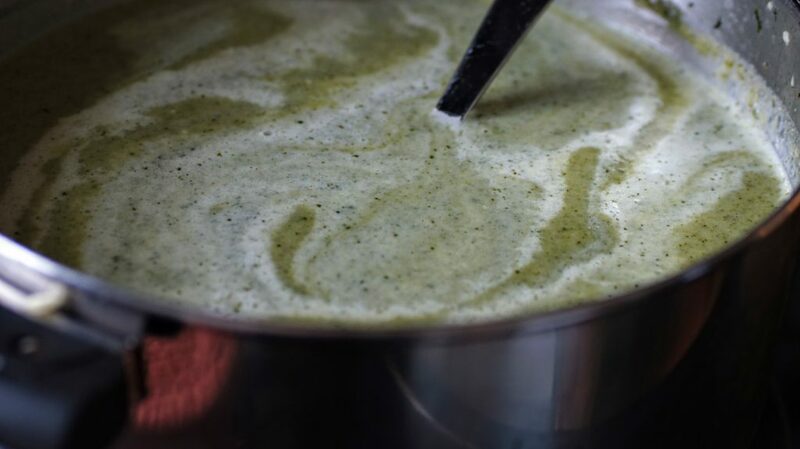 To make the soup vegan/dairy free omit the 2 cups of milk and add in 2 additional cups of stock. The soup will remain creamy due to the cauliflower. 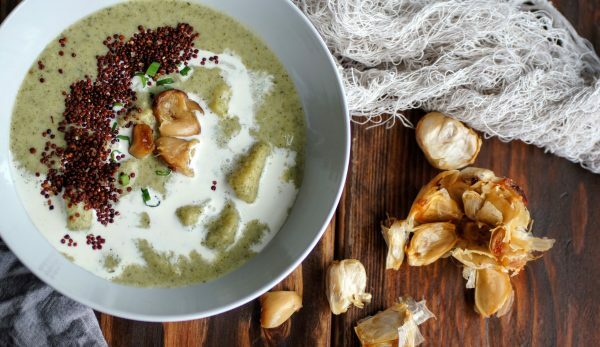 Check out Genius Kitchen for steps on properly cleaning and toasting Quinoa. I added Jacobsen Steak Seasoning while the quinoa toasted in the pan. Feel free to season however you'd like. 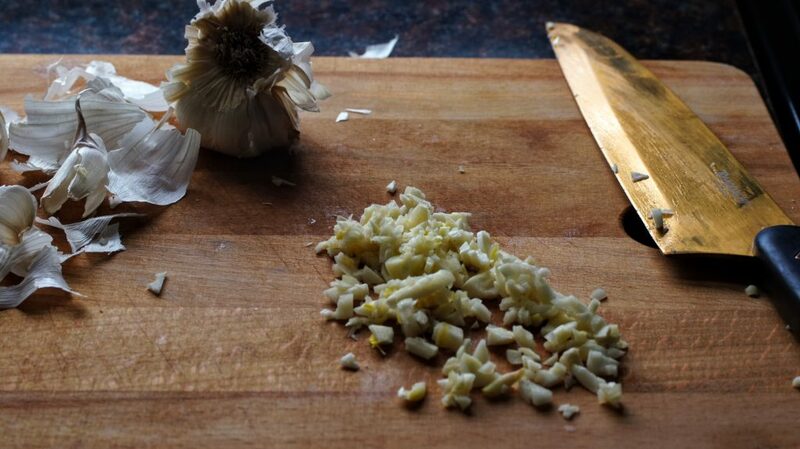 To roast whole garlic, remove the bottom to expose as much of the garlic as you can. Gather your garlic heads and place in foil. Drizzle 1-2 tsp of olive oil on exposed garlic. Wrap up and place in 400 degree oven for 40-45 minutes until the garlic is caramelized and gooey. So good and the kids love it too!